Cyber Nup | When Do They Serve The Wine? I am married to a man who has a blog, but is not on twitter. Out of kindness, and because I think he’s interesting, I sometimes tweet his blog posts. But what if he were on twitter, and I didn’t feel inclined to RT his tweets? I think some sort of guidelines need to be written for this. Maybe there should be an addendum to the Pre-Nup, a Cyber Nup. That way, everything would be up front before you get too “involved.” I mean, failure to RT should not be grounds for divorce, but you never know. 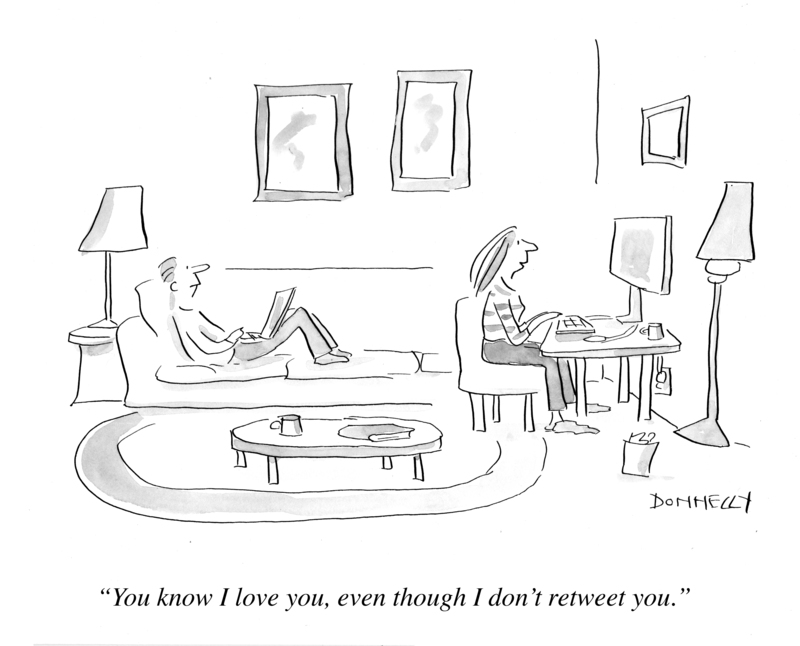 This entry was posted in Random but Relevant and tagged cartoons, divorce, marriage, Michael Maslin, New Yorker, Online Communities, Prenuptial agreement, Social Networking, twitter. Bookmark the permalink. Wow, The New Yorker really missed out on this one–FABULOUS! Thank you, Debby! Yeah, well…. however, that your marriage will survive. I’m assuming the gentleman on the sofa, with the laptop, represents Mr. Maslin. sofa, at midnight, with his laptop? When does he do his cartooning?